We learned a very important lesson when we were in Czech Republic in 2012. While the capital city of Prague is interesting and worth a visit, there are many more interesting cities in the country that do not have the tourists or the tourist prices. The city of Sibiu, Romania, with the Carpathian Mountains in the background. And so, while we will be arriving and departing from Bucharest, we will only spend a couple of days there at the beginning. If we're interested in more, we'll do that before we leave. Otherwise, we will get out of the big city and explore the places nobody else goes to. Print out a map found on the internet for making notes. We'll probably do a lot of travel by local bus. But, we do also have plans to rent a car for a few days at a time. We want to explore a lot of the mountains and do some hiking and we've read how much easier it is by car. Car rentals aren't that expensive in Romania and we're going to be there during low season. Of course you've all heard of the legends of Dracula and Transylvania. We'll be visiting Bran Castle, the home of the title character in the novel Dracula. Then, simply going from village to village staying either with couchsurfing hosts or in small pensions and guesthouses. From there, a circular route into the country of Moldova (the least visited country in Europe) and Transnistria on the the Moldova Ukraine border. We're decided that there is enough to see in these two countries in six weeks that we likely won't be making a detour into Serbia or Bulgaria. And so...the research continues. We can't wait to show you more of this interesting "off the beaten path" country! Can't wait to be along for the ride. I find the less you travel around the more you get to see plus costs are lower as most of the cost of traveling is going from point A to point B. I love going to cities of less than 300,000 in population, lots to see and do without the gigantic mess of traffic and noise. We totally agree and this is why we are doing the way we are. We aren't in it to count countries but to enjoy the country and learn about it and the culture and see as much of the scenery as we can, that's why we have lots of hiking in mind. Sibiu is beautiful and so is Brasov and Sighisoara! I also recommend staying in one of the old renovated farm houses by the Mihai Eminescu Trust. http://www.mihaieminescutrust.org/guesthouses They are pricey but the trust is trying to rebuild old villages - most of the German-Romanian population has left those villages and went back to Germany. I can also recommend the castle of Peles. I thought it was much prettier than Bran and also has some connection to Dracula. Thank you for the advice Sabine. We will look into staying at one of these renovated farm houses. We generally try to travel on the cheap but we also like to have neat experiences so we may just splurge for a night or two in one of these. Peles, is definitely on our list of castles to see. It looks beautiful! And, Sibiu and Sighisoara are also on the list and we will most likely stay in Brasov as well. Looks like you will be having a fun 6 weeks, looking forward to your postings. Just bear in mind that the weather will be cold and rainy at that time - similar to Ontario in November... Hiking the Carpathians in the summer is lovely. Yes...we're aware of that. Hoping for slightly warmer than Ottawa for that time of year, but provided it stays above freezing, we're okay with that. "We learned an important lesson in 2012...there are many more interesting cities that do not have tourists or tourist prices." An important lesson here too. We were in Cape Cod recently, a place you have to go to if you're nearby. But there are lots of less famous places we enjoyed more on the trip. We have been in that area before but at the time we were just passing by. It was still at the height of busy season and we had now desire to fight with crowds at Cape Cod. We want to visit Boston some day so I am sure when we do that we will make Cape Cod a visit as well. When we went through the New England states we were more north and spent way more time in the White Mountains hiking then in any of the towns or small cities. 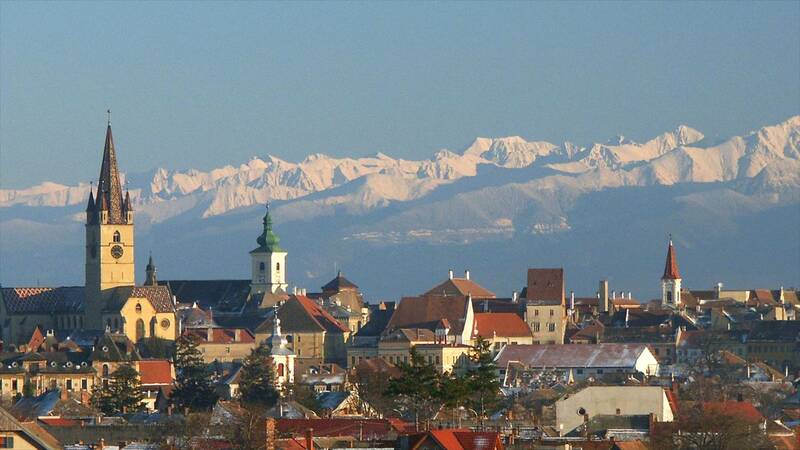 That photo of Sibiu is absolutely gorgeous. How blessed you two are being able to visit such historic countries. It looks like a city that is right up our alley! Looking forward to visiting it. Don't forget to visit the monuments that were built with slave labor by Nicolae Ceaușescu. They are huge and are now used for public spaces. A true part of history. Two good books about Romania and I think I mentioned them already; Bury Me Standing, and Green Plums. Interesting reads with insights into Romania. I love gypsy culture. We will have to look up some of these monuments that you are talking about. I am sure that we will come across a few of them on our travels. Exciting! We spent a month there last year, using Brasov as a base. A couple of tips if I may. Close to Brasov, make sure to see some of the German fortified churches. They were a highlight for us. Bran castle was a real disappointment, a tourist trap. But close to it is the fortress of Rasnov - mostly ruins but interesting with fantastic views over the countryside. BUT the highlight is Peles castle in the town of Sinaia (you can take the train there from Brasov or Bucharest, it's about halfway between both). It's incredible. If you can, overnight in Sinaia as it's a pretty town and we were sad we didn't spend more time. If you want more info, have a look at some of our posts on Romania. Thanks for the info Frank! We will keep these in mind and I have added them to the list. We sort of figured that Bran Castle would be a bit of a disappointment but love the idea of the fortress of Rasnov. We like ruins of old buildings and maybe there is even a hiking trail to it that we can take rather than driving or taking the bus. Peles is definitely on our list to visit, it look gorgeous. We will be staying most of the time in little towns along the way and while in the Transylvania area we will most likely rent a car. We'll have a look at your posts on Romania to gather more insight, thanks!